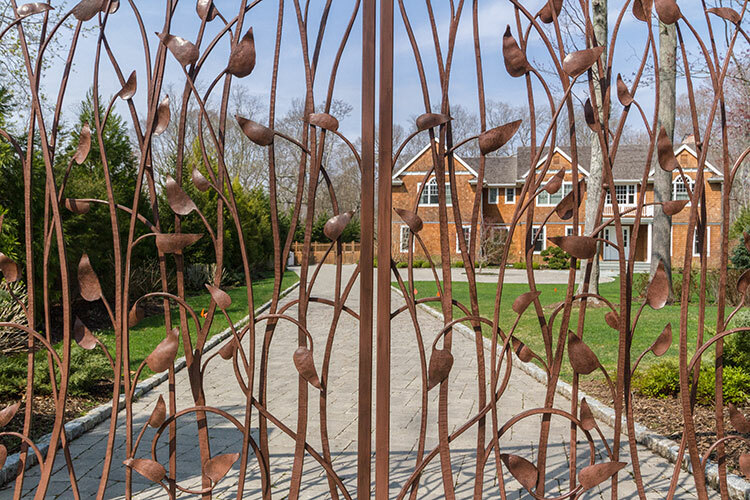 These gates consist of over a hundred leaves and stems hand forged from bar stock. To create this design, it was required to project the full-size drawing onto the studio wall. Each leaf and stem had to be custom forged so that it would match the projection. By layering the leaves and stems on the front and back of the gate, we achieved a three-dimensional aspect to the the overall design. It took patience and skill to turn this design into a reality. The gates were finished with a custom 2 part urethane paint and then treated with a hand applied dry brushed finish.